Continuous stress has been shown to have a gradual damaging effect on the circulatory system, digestive tract, lungs, muscles and/or joints. It also hastens the process of aging. We believe that it is possible to live in stressful situations over a relatively long period of time if we can find ways to manage the stress. 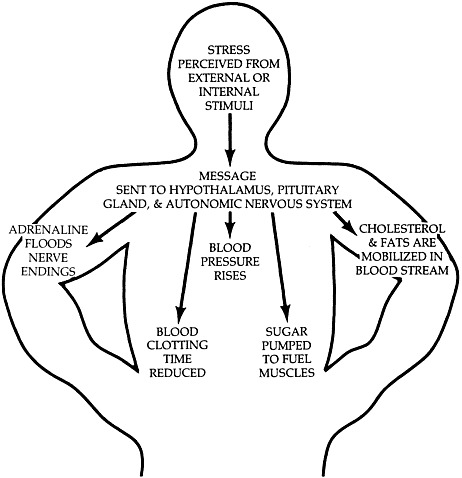 The diagram below suggests what happens as our system responds biochemically when we are under stress. We have all heard stories of people being able to “lift pianos” and do other wonderful and amazing feats under conditions of a house fire, automobile accident, etc. While that “high-voltage” charge of chemicals in our system makes it possible for us to do incredible things, it also can be a kind of poison in our system if conditions stay at a peak indefinitely. Our task is to find a way, preferably something we can do daily, to restore our normal hormone balance. Finding our own best way to bring the stress level down, on a regular basis, is both a challenge and a discipline. 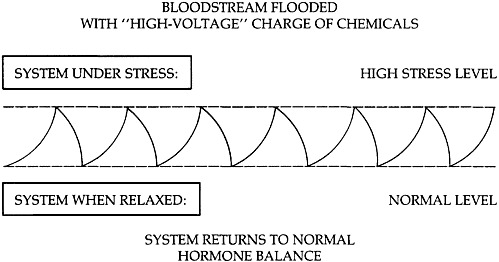 We should also note that if we do not find that systematic way of bringing our stress level down to “normal,” the tendency is for our system to simply adjust to being at the “high-voltage” level, which then becomes destructive to both our physical and emotional systems. The goal is to return to a normal hormone level on a regular basis. Understanding the many forms of stress has been the focus of this first section. Stress in the workplace is the topic in the second part of this chapter. Examining this issue from the perspectives of both a supervisor and an employee allows us to think about the important part both play in setting a climate for either creating or managing stress. It is important to recognize, however, that a certain amount of stress is necessary in order to get work done. A supervisor needs to ask the question “What do I do or what should I do to create a less-stressful environment for my employees?” Some supervisors are referred to as “carriers of stress.” This is the analogy to a carrier of a virus that can be spread among the population. As an employee, what can or should I do to create a less-stressful environment for myself and others? If we can accept the notion that “I stress me” (meaning I allow others to stress me), then I am willing and able to look at issues that help me so that I might determine how best to deal with stress in the workplace. Occupational stress is prevalent in most work situations. Today, it is unrealistic to expect that jobs are stress-free. However, if the organization’s culture and the climate are such that both employer and employee are willing to work together in identifying stressful situations, stress can be minimized. Below are seven typical job stressors. Look at the list and add an additional three stressors that come from your own work experience. Rank them in descending order to determine the areas of stress most pertinent to you. ___ 1. I am trapped in situations of conflict between people who expect different things of me. ___ 2. I am overloaded—they assign more than can be done (or) more than can be done well and maintain my self-esteem. ___ 3. I have ambiguous job responsibilities; I am not clear about the scope of my job. ___ 4. I am insecure about venturing outside my normal job boundaries. ___ 5. I have difficult bosses (or subordinates). ___ 6. I worry over carrying responsibility for others. ___ 7. I lack participation in decisions affecting my job. The symptoms below are suggested as being particularly helpful in diagnosing stress in the workplace. Add any additional symptoms from your own experience. 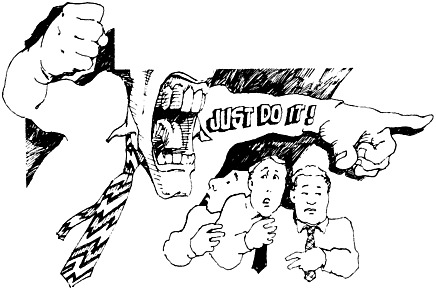 When events are faced with cynicism and negativism. When the drive to pursue perfection pushes one beyond what is realistically possible. When conflicts with spouse and family seem to be increasing without clear reasons. When alcohol and/or other drugs become an escape from the pressures of the job. When there is a tendency to bully and/or seek perfection from those one supervises. When there is little time planned for anything except work. When it seems impossible to relax or enjoy leisure activities because one’s mind is constantly on work. When one feels ill at ease in social situations that are not related to work.